Firstly, many thanks to the many wonderful people who left comments here or on Facebook or who sent lovely emails after my last post. I've been quite fragile lately but you've made me feel stronger and a little bit protected from the blows of future criticism. The few scarfy-shruggy rectangle-based things I made a little while ago got me thinking about other wrap-and-sew structures for knitted rectangles. I decided to try this idea on last year's rectangles before I knitted up any new ones. I've been felting them a bit, too. The blue one felted up nicely, but I think the red one might need a few spins in the dreaded front-loader to disguise all the little pulls and holes in the knit. Other restructuring activities include the revamping of a few of my smaller projects: converting them into digital downloads. You can find them over at Pink Chalk Farics. So far, we have the Pyramid Purse, the Lavender Handbag (which also makes a cute little pincushion) and the Fabulous 50's Bib. These are all my go-to "quick gift" projects. The patterns have nice spiffy-new colour photographs and re-vamped pattern pieces. There is still a lot to do here... organising the path ahead while bringing the tail end of the good ship YOU SEW GIRL around. You can expect to see more revampings and restructurings.... and you can definitely expect to see more knitty wrappy things. Big love... especially the one at the top. The back looks brilliant. Totally ace. Geeze, woman. Love those tops but I have to say- with your figure, you'd look fab in a hessian sack. I really need to make something with that toottoot fabric, it's sitting upstairs! 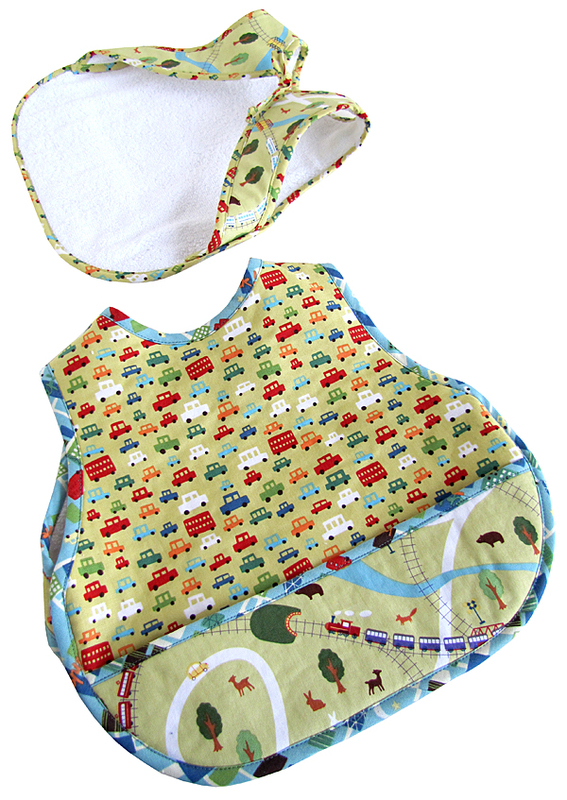 Love the bibs - full of colour (to disguise the food spills!). Amazed at what you can do with a knitted rectangle. They look very warm and snuggly, just what is need for a Melbourne winter. So inventive - fantastic use of a rectangle! Wow, those tops are so inspiring! 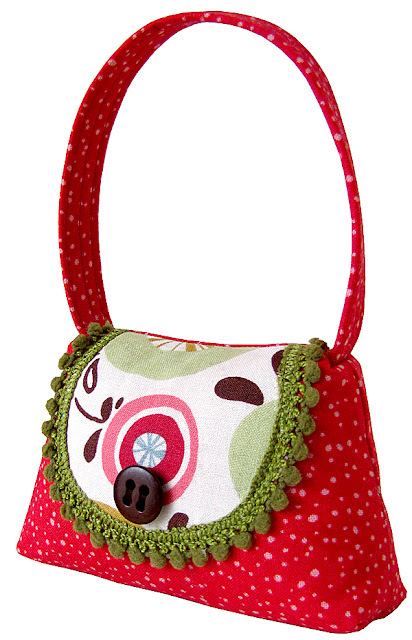 The purse and bibs are very nice too, so cute! Loving the twisty, wrappy things! Inspiring. 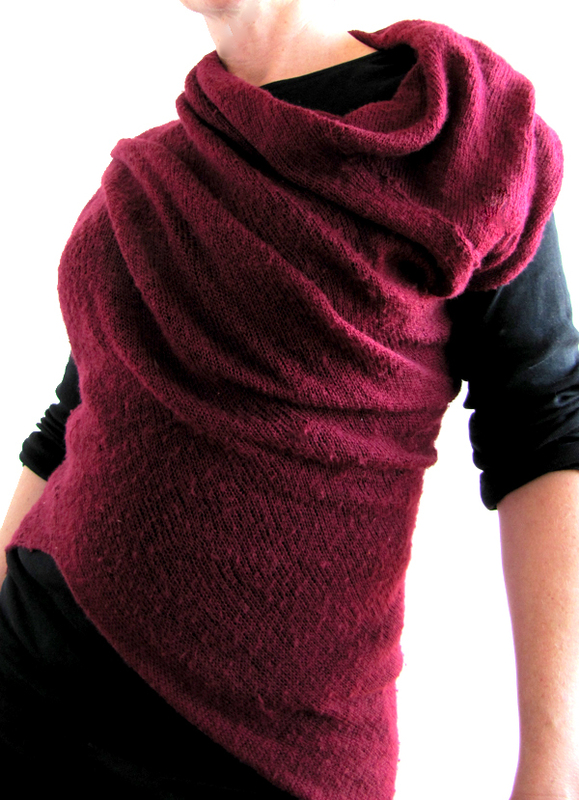 I LOVE those knit wraps. They look crazy cool!! A good revamp does wonders for the soul, and that blue top is gorgeous!